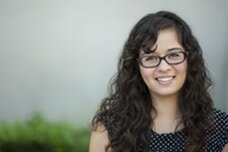 Wendy Ochoa, doctoral candidate in the School of Education at UC Irvine with a specialization in Human Development. Wendy's experience of being raised by two hard-working and loving immigrant parents, who did not often have access to the resources they needed to optimize her and her siblings’ learning, shaped her research interests. She is interested in doing research that focuses on providing low-income and linguistically diverse parents from ethnic minorities with a set of tools that supports them in fostering their children’s academic success and socio-emotional wellbeing. Her dissertation studies focus on investigating the role of smartphones and tablets on the quality of parent-child interactions, and on understanding the ways in which socioeconomically diverse, Latino mothers and fathers of young children use this technology and how they believe it supports and/or hinders their parenting and child’s learning. These findings will be used to inform future efforts that seek to promote optimal media habits for low-income, ethnic minority families with young children. She is also currently part of the Baby Books 2 Intervention project, which explores the effectiveness of embedding educational information about child development and optimal parenting practices into bilingual baby books. Eventually, Wendy aims apply her research by working closely with her community and mentoring students from underrepresented backgrounds through college. During her free time, Wendy enjoys spending time with her family and friends, and visiting her extended family in Mexico. Wendy's research interests include child development, parenting, Latino parents, literacy development, and the relation between the home environment and children’s development. Mancilla-Martinez, J., Greenfader, C., & Ochoa, W. (in press) Spanish- speaking preschoolers' conceptual vocabulary knowledge: Towards more comprehensive assessment. NHSA Dialog, The Research-to-Practice Journal for the Early Education Field. Ochoa, W., Reich, S., Cabrera, N., Gaona, A., & Salcedo, Y. (under review). Does mother know best? Assessing knowledge of child development among predominantly low-SES Latino mothers and fathers. Reich, S.M, Hoeft., Díaz, G., Ochoa, W., & Gaona, A. (accepted). Disparities in the quality of pediatric dental care: new research and needed changes. SRCD Social Policy Brief. Reich, S.M., Ochoa, W., Gaona, A., Salcedo, Y., Bardales, G.Y., Newhart, V., Lin, J., & Diaz, G. (under review). Reich, S., Ochoa, W., Diaz-Lara, G. (in preparation). Using baby books to decrease the depressive symptoms of first-time mothers.